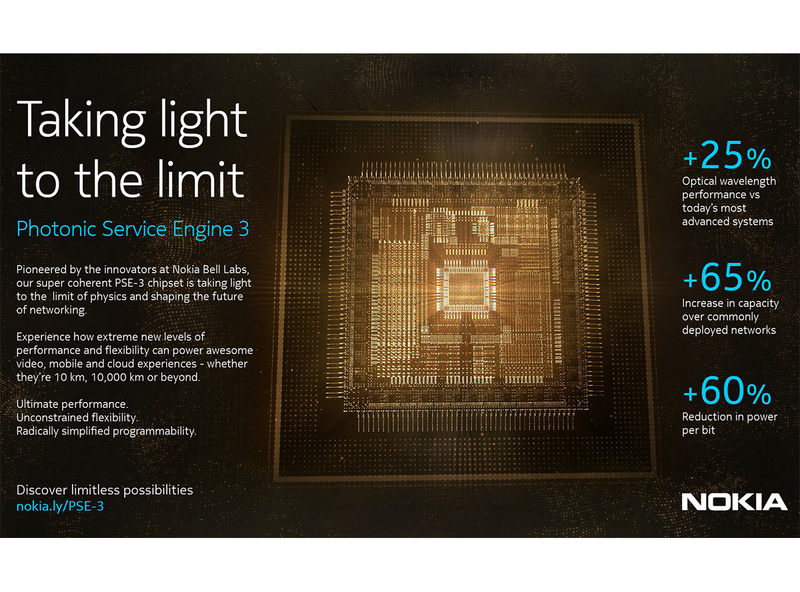 Polish service provider Netia conducted the first field trial of Nokia's Photonic Service Engine 3 (PSE-3) super coherent technology over a live production network. In the trial, wavelengths driven by the Nokia PSE-3 and operating at 62-68 Gbaud traversed Netia's flex-grid infrastructure in 75GHz channels. Network paths currently supporting 100G and 200G wavelengths were shown to support of greater than 300G and 500G respectively, more than doubling network capacity. Netia's WDM backbone based on the Nokia 1830 Photonic Service Switch (PSS) with flex-grid technology, which enables a seamless upgrade to high baud-rate wavelengths, allowing the carrier to more than double supported data rates for links of any distance. Nokia said its PSE-3 powered line cards will significantly improve fiber capacity while lowering costs and simplifying operations. As the largest alternative network operator in Poland with over 50,000 kilometers of fiber connecting more than 80 percent of the A and B class office buildings throughout Poland, Netia is experiencing tremendous growth in demand for both consumer offerings and MEF-certified business services. Grzegorz Bartler, member of the board and CTO at Netia, said: "Netia continues to invest in our infrastructure to ensure our customers benefit from the most technologically advanced network in Poland. The results of this field trial mean that our backbone network, originally designed for a total capacity of 8.8 terabits-per-second, now has a proven roadmap to 29 Tbps, ensuring we can continue to keep up with the rapid growth of our business and consumer services." 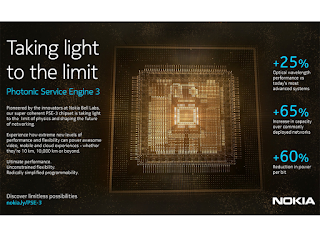 Nokia unveiled its Photonic Service Engine 3 chipset featuring probabilistic constellation shaping (PCS) that pushes fiber-optic performance close to the Shannon limit to fully exploit channel capacity. PCS is a new modulation technique pioneered by Nokia Bell Labs that the company says enables maximum capacity over any distance and on any fiber - from metro to subsea - increasing capacity up to 65% over currently deployed networks while reducing power by 60%. This includes 200G rates over most terrestrial and subsea links, as 400G over most shorter distances. The PSE-3 chipset, which is the first coherent digital signal processor to implement PCS, provides finely adjustable wavelength capacity from 100G to 600G with a single, uniform modulation format, baud rate, and channel size. This simplifies network operations and planning. Intel announced its first Ethernet 800 Series adapter with Application Device Queues (ADQ) technology, which increases application response time predictability while reducing application latency and improving throughput. 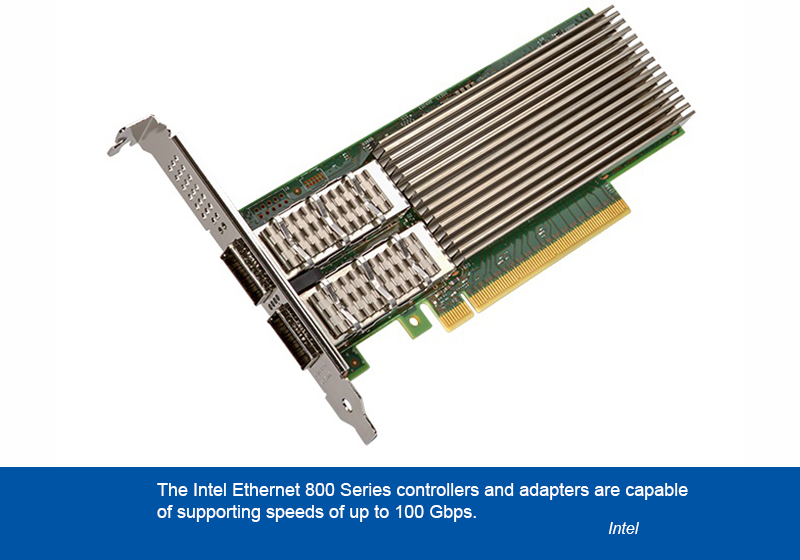 The Intel Ethernet 800 series adapter features up to 100Gbps port speeds and is aimed at moving massive amounts of data in cloud, communications, storage and enterprise market segments. Intel has shipped over 1.3 billion Ethernet ports to date. 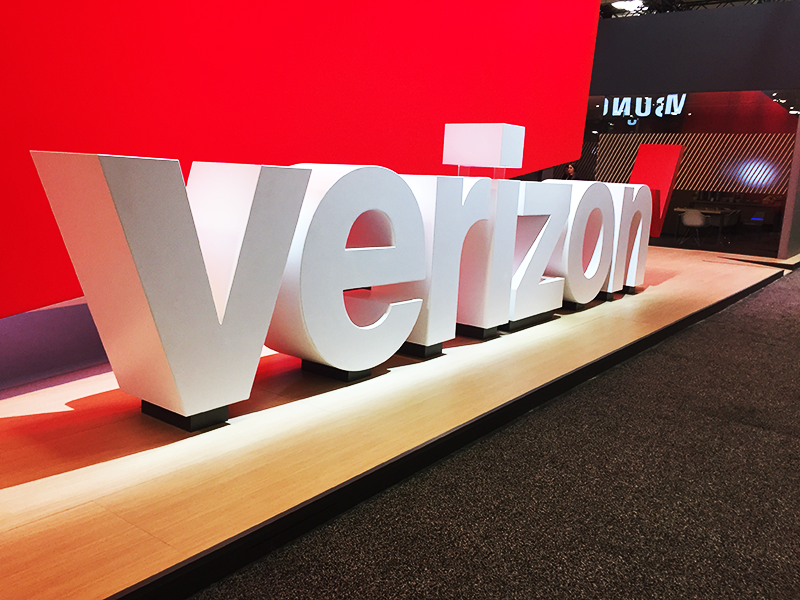 Verizon officially activated its 5G mobile network in parts of Minneapolis and Chicago. The launch comes a week ahead of schedule. Early customers in Chicago and Minneapolis should expect typical download speeds of 450 Mbps, with peak speeds of nearly 1 Gbps, and latency less than 30 milliseconds. Verizon is offering the moto z3 combined with 5G moto mod as its first 5G smartphone and CPE. The company said it is on track to activate the 5G service in 30 U.S. cities this year. Colt Data Centre Services (Colt DCS) has acquired a site in Osaka, Japan to house its first hyperscale data centre near the city. The expansion is driven by the surge in cloud service providers in Japan. Construction of the 30MW hyperscale facility is expected to commence later this year. The Osaka data centre will be Colt DCS' third hyperscale data centre in Japan, adding to the existing Inzai campus just east of Tokyo, which already houses two other hyperscale facilities. "The acquisition of the site and our continued focus and investment in Japan is being driven by our hyperscale customers who are in need of large capacity requirements and require reliable and scalable solutions. We are confident that our track record of building and delivering hyperscale facilities will be able to support the influx of cloud service providers in the country as they continue to expand their operations. The Osaka site acquisition is yet another step forward for us in significantly strengthening our foothold in APAC as well as being testament that our land banking strategy remains solid." Amazon Web Services (AWS) will open an infrastructure region in Indonesia by the end of 2021 / early 2022, its ninth in Asia Pacific including Beijing, Mumbai, Ningxia, Seoul, Singapore, Sydney, Tokyo, and an upcoming region in Hong Kong SAR. The new AWS Asia Pacific (Jakarta) Region will consist of three Availability Zones at launch. Currently, AWS provides 61 Availability Zones across 20 infrastructure regions worldwide, with another 12 Availability Zones across four AWS Regions in Bahrain, Hong Kong SAR, Italy, and South Africa expected to come online by the first half of 2020. LF Networking (LFN) is expanding its OPNFV Verification Program (OVP) to include Virtual Network Function (VNF) compliance testing. The expanded OVP, created in conjunction with the ONAP testing community, now includes publicly-available VNF compliance test tooling based on requirements developed within ONAP, as well as a Verified Labs Program and the induction of the University of New Hampshire-Interoperability Lab (UNH-IOL) as the first OPNFV Verified Lab. Initially developed to simplify validation testing of commercial NFVI/VIM products based on OPNFV, the expanded program now covers interoperability with ONAP-compliant on-boarding requirements using both Heat and TOSCA package validation. The first of its kind, OVP combines open source-based automated compliance and verification testing for multiple parts of the NFV stack specifications established by ONAP, multiple SDOs such as ETSI and GSMA, and the LF Networking End User Advisory Group (EUAG). Demonstrating the readiness and availability of commercial products based on these requirements improves time-to-market, reduces costs, and improves the overall quality of NFVI and VNF deployments. OVP has also created a Verified Labs program to augment the current self-testing model, giving users the choice to test their products/services with these Verified labs or performing the testing in-house. Benefits of working with a Verified lab include access to subject matter experts, additional test infrastructure, and they enable ecosystem-wide scaling as the number of VNFs entering the market increases. This program is also overseen by the LFN Compliance and Verification Committee and passing labs receive a badge. UNH-IOL is the first lab to receive the OVP Verified Lab badge, and other labs active in the LFN communities are encouraged to submit an application. The NBASE-T Alliance and the Ethernet Alliance will consolidate their activities under the Ethernet Alliance. The NBASE-T Alliance is focused on enabling the development and deployment of products that support 2.5GBASE-T and 5GBASE-T Ethernet. The Ethernet Alliance serves as the premier global repository for all things Ethernet, helping keep everyone with an interest in Ethernet aware of advancement and innovations in the technology. This agreement serves as a significant growth milestone for the Ethernet community and represents four years of collaboration between the organizations, including joint market research, member plugfests and support of the IEEE 802.3bz 2.5GBASE-T and 5GBASE-T Ethernet standard development. “In just over four years, the NBASE-T Alliance member companies helped build consensus within the IEEE 802.3™ Ethernet Working Group, enabling approval of a new 2.5G/5G Ethernet standard, and deployed the technology so it is now entrenched in multiple markets well beyond our target industries. With the momentum growing stronger every day, the time is right to consolidate the strength of our members with the Ethernet Alliance, the leading voice of Ethernet technology, to ensure NBASE-T, and all Ethernet technologies, continue to best serve the needs of the market,” said Peter Jones, NBASE-T Alliance Chairman. The University of New Hampshire InterOperability Laboratory (UNH-IOL) is the first lab to complete and receive the verification badge as the first OVP Verified Lab within the OPNFV Verification Programs. As a verified test lab, the UNH-IOL has demonstrated a commitment to the open source community and a level of competence in the execution of testing. This announcement comes with the expansion of the programs to include testing of VNFs (virtual network functions), based on requirements defined within the ONAP project. Previously, the programs included functional testing of the NFVI platform or infrastructure, according to a set of tests agreed within the OPNFV community. The UNH-IOL has been working with the OPNFV and Linux Foundation since late 2016 as the host for OPNFV's Lab as a Service (LaaS) infrastructure, providing community and developer resources for the Linux Foundation's Networking Projects. The UNH-IOL is also hosting hardware for other OPNFV projects, available to developers within those projects. Aqua Security, a start-up based in Tel Aviv, Israel, announced $62 million in Series C funding for its cloud-native security solutions. Aqua’s Cloud Native Security Platform provides visibility and security automation across the entire application lifecycle, using a zero-touch approach to detect and prevent threats while simplifying regulatory compliance. Aqua has extended its platform to support serverless environments, and all major cloud and orchestration environments. Its solutions are available on demand with consumption-based pricing on the recently launched AWS Marketplace for Containers and Google Kubernetes Apps Marketplace, as well as on Azure Marketplace. Aqua said it now has more than 100 blue-chip companies across the energy, aerospace, internet, media, travel, retail, pharmaceutical and hospitality sectors among its customers. The company also claims that its platform secures five of the world’s ten largest container production deployments.